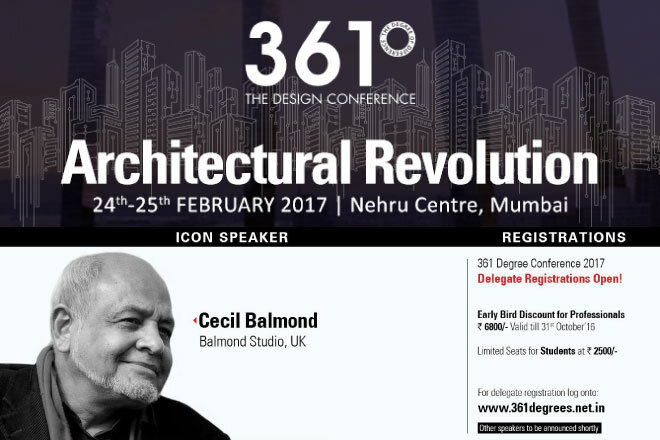 Cecil Balmond is due to visit India's largest city as Icon Speaker for the tenth edition of the 361° Design Conference. This year's theme, Architectural Revolution, will explore the challenges that designers and architects face in a rapidly evolving urban environment and how modern systems and tools can play an essential role in the quest for resilient design. Being a pioneer of emergent form and non-linear organisation, Cecil will offer a unique perspective on the practical and conceptual issues and solutions that designers encounter today . Cecil will also be joined by Brinda Somaya of SNK for a one on one discussion on the same theme.